Diablo Iron is a third-generation family-owned & operated metal fabrication company in the San Francisco Bay area since 1972. We specialize in the highest quality metal fabrication, reliable customer service and attention to detail in all of our projects. Diablo Iron’s 50 years of working with many of the leading commercial and residential contractors in the Bay Area has established our reputation as a competent and reliable source of steel fabrication and ornamental iron work. Diablo Iron is fully insured, bonded and licensed as a B-General Building Contractor, C-23 Ornamental Metals and C51 Steel Structural. As a custom architectural metal fabricator and supplier of ornamental and architectural metalwork, Diablo Iron helps commercial and residential customers achieve value-engineered design solutions that surpass the highest construction standards. Our Benicia, California-based metal fabrication facility is fully equipped with materials, state-of-the-art machinery, tools, capabilities, and talent. Serving Northern California and beyond, we work collaboratively with interior and landscape designers, architects, contractors, construction professionals, fellow artisans, and homeowners. Our expertise covers the full spectrum of architectural metals, including custom ornamental iron, finished stainless steel, bronze, brass, copper, and aluminum. Projects may include: custom automatic driveway gate systems, forged garden gates, embossed railings, wrought iron architectural adornments, spiral staircases, architectural steel, and so much more. For more than 40 years, our customers have appreciated our expertise, professionalism, and metal artistry. We are proud of our fabrication and finish standards, architectural integrity guidelines, and rigorous code compliance. We’re fully insured, bonded, and licensed in B – General Building, C23 – Ornamental Metals, and C51 -Structural Steel. Diablo Iron is firmly dedicated to environmental responsibility – using energy-efficient equipment and recycling all scrap metal generated. Protective coating specialists, our custom green-rated faux finishes, powder coatings, galvanizing, and liquid paints are of the highest and most durable quality. Diablo Iron provides recommendations, samples, and guidance to ensure that your project meets your expectations. To ensure an accurate, safe, and lasting result, Diablo Iron handles installation and integration with the surrounding hardscape, landscape, and built environment – whether a simple garden gate or 5,000-lineal feet of perimeter fence. 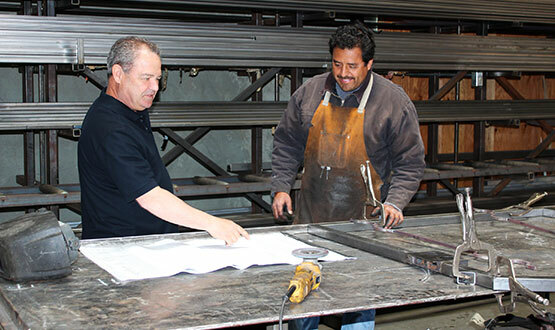 Diablo Iron coordinates every project from initial concept and ideation through prototypes, fabrication, manufacturing, installation, and punch list completion. We stand behind our work and are readily available by phone Monday through Friday 8 AM – 5 PM PST or email us at info@diabloiron.com.